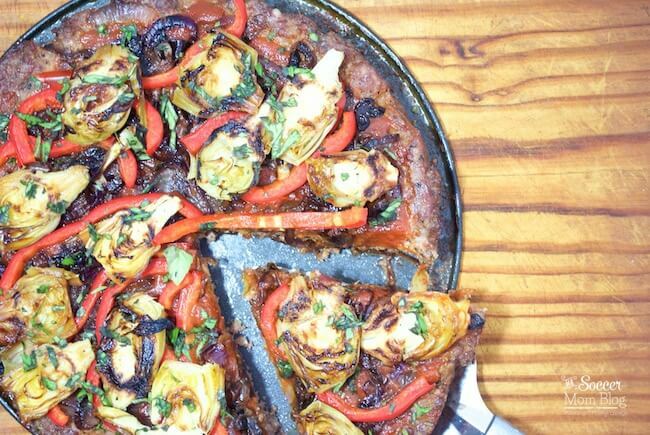 Who says you can’t enjoy pizza on a gluten free diet? 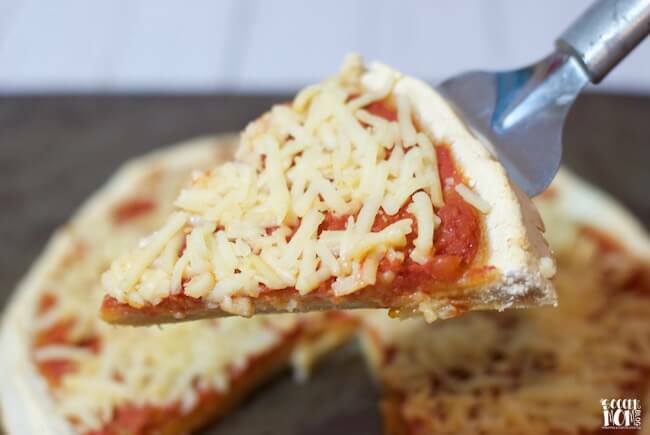 This gluten free pizza dough is a delicious guilt-free dish, and you’ll never believe how easy it is to make! It seems like the older I get, the less “junk” my body will tolerate. Pizza used to be one of those foods that I couldn’t eat without regretting it later. And most store-bought gluten free options were disappointing. However, my husband made it a mission to create a gluten free pizza that actually tasted good. 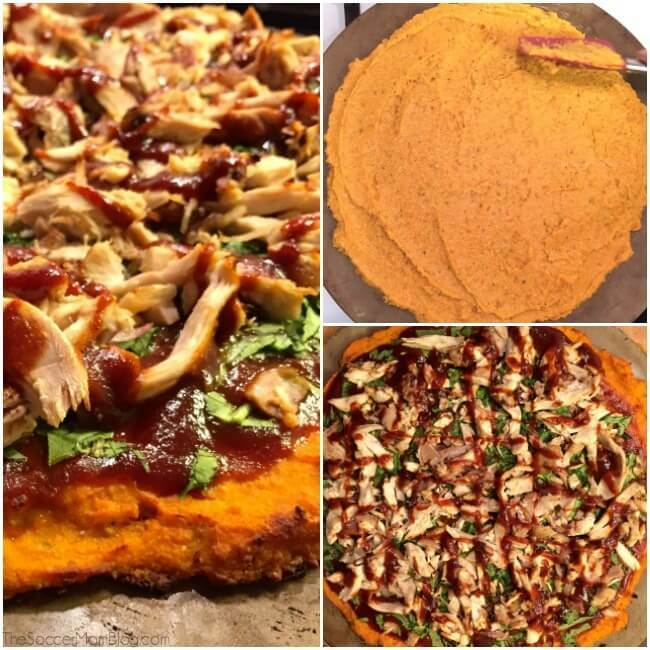 That first recipe, Healthy Barbecue Chicken Pizza with Sweet Potato Crust turned out SO amazing that I had to share. To this day it is still the most popular recipe on the blog! 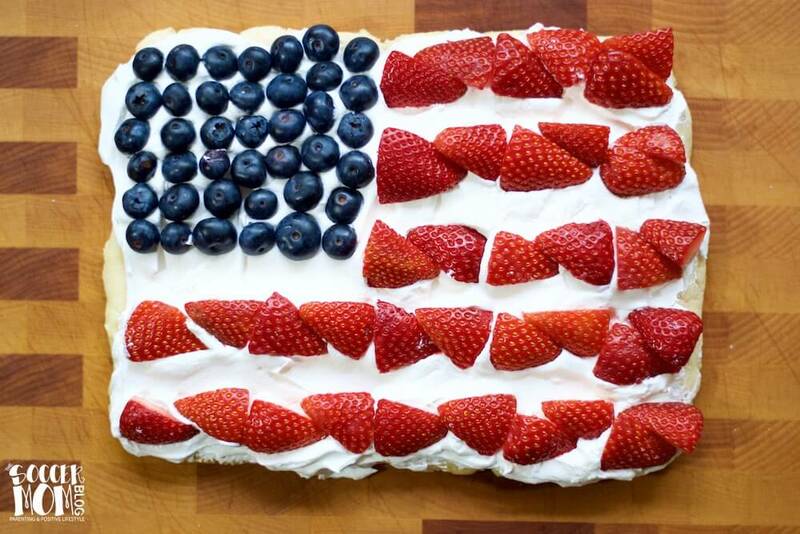 Recently I was inspired to create an American Flag Gluten Free Fruit Pizza for the upcoming summer holidays. But our sweet potato crust isn’t quite the right flavor for this dessert pizza. 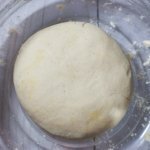 So I challenged my husband to create a new all-purpose gluten free pizza dough…and he did not disappoint! 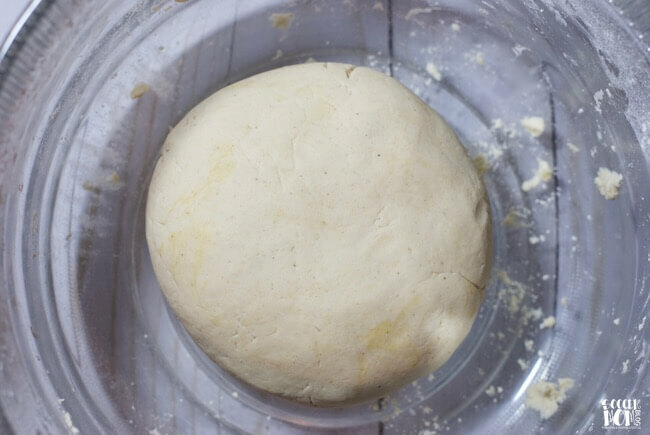 This gluten free pizza dough is made with simple, real food ingredients, and easy! Cassava flour can be found in the natural food section of most major grocery stores, or you can purchase through Amazon (I put a link in the ingredients list). Since there is no yeast in this recipe, you don’t have to wait for the dough to rise. Super easy and much faster than traditional dough! Affiliate links provided for your convenience in recreating this recipe; read our disclosure policy here. Sift flour, baking power, sugar and salt into a large mixing bowl. Add 1 tablespoon of oil and slowly add water, mixing as you go. TIP: Adding water slowly as you mix helps the dough to mix more evenly. Once a dough begins to form, remove from bowl and place on a cutting board dusted with cassava flour. Coat your hands with the flour and knead for 2-3 minutes. Lightly grease a baking sheet or pizza stone with olive oil. Spread your pizza by hand until it’s about 1/4 – 1/2″ thick. Pinch the edges to form a crust. Bake for 15 minutes at 400°F. 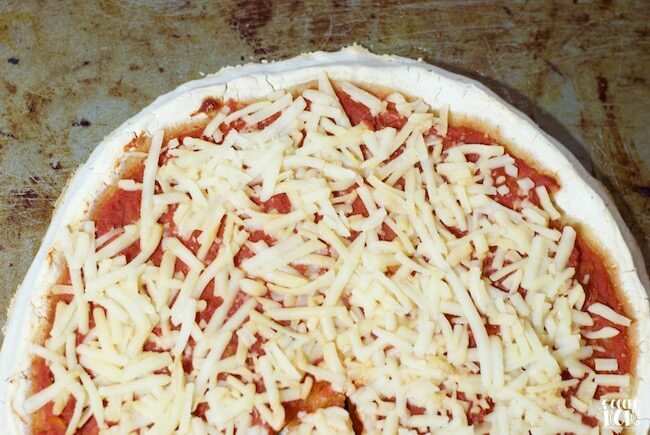 Remove from oven and add your desired toppings (we used tomato sauce and dairy free cheese for ours – feel free to use your favorites!) Return pizza crust to oven and bake for 10 additional minutes. Note: If you’re making making a dessert pizza like our Gluten Free Fruit Pizza, then you won’t remove the pizza from the oven halfway through or cook the toppings. Simply bake the dough for 20-25 minutes until done, then remove from oven and allow to cool before adding your dessert toppings. No yeast = no waiting! 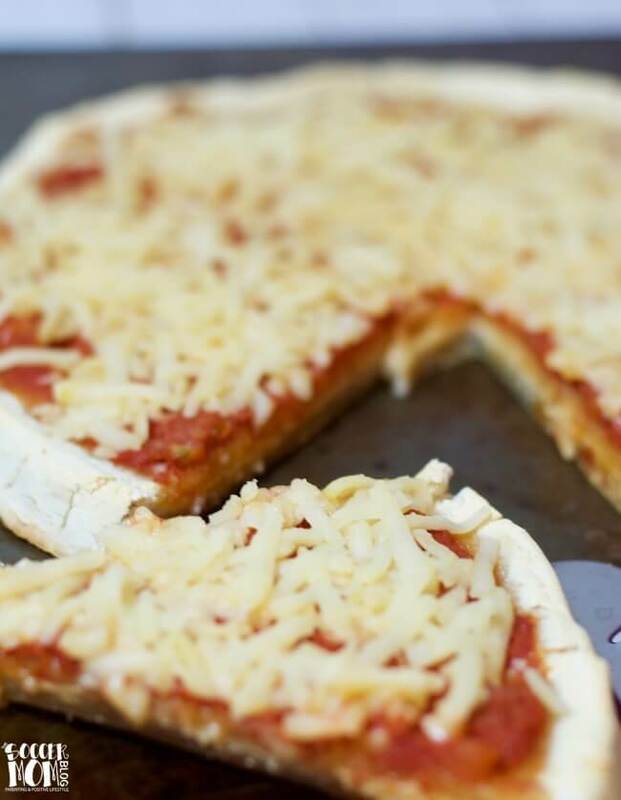 Quick & easy gluten free pizza dough recipe that makes both sweet and savory pizzas! Sift flour, baking power, sugar, and salt into a large mixing bowl. Add 1 tablespoon of oil and slowly add water, mixing as you go. Once a dough begins to form, remove from bowl and place on a cutting board dusted with cassava flour. Coat your hands with the flour and knead dough for 2-3 minutes. Lightly grease a baking sheet or pizza stone with olive oil. Spread your pizza by hand until it's about 1/4 - 1/2" thick. 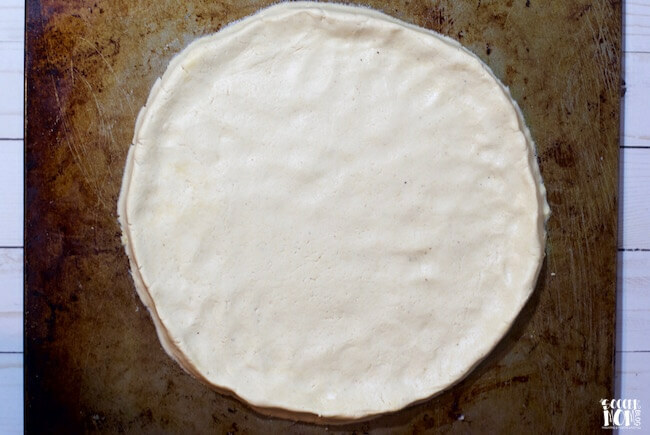 Pinch the edges to form a crust. Bake for 15 minutes at 400°F. Remove from oven and add your desired toppings, then return pizza crust to oven and bake for 10 additional minutes. The ingredients says you need 1 tbsp of sugar, but nowhere in the recipe does it say when to add the sugar .. so is sugar supposed to be in this recipe or not ? Hi Jennifer – You can add the sugar when you sift the other dry ingredients. I must have accidentally left it out when typing up instructions, but I’ve edited the recipe. It’s not essential, so if you’re trying to limit sugar in your diet you can omit. Hope this helps!